On Monday the first job was to clear up litter from Windermere's lake shore after a weekend of sunny weather; the image above was taken at Millerground. Cockshott Point and Jenkyn's field are other lake shore properties that are regularly patrolled by Central and East Lakes countryside rangers. The oak gates to Millerground were not looking at their best. The fittings were ready for a repaint as well. The gates were sanded down..
treated to some teak oil..
and the fittings including the hinges and gate catch repainted. Wall by the path to Stickle Ghyll. Part of the wall, particularly the coyne end by the gate, was ready for a rebuild; the image above shows the wall in the process of being taken down prior to rebuilding it. Work was frequently interrupted by the many visitors using the path. Good opportunities to engage! This school group are on their way back from ghyll scrambling. The rebuilt section of wall finally completed! The rare Touch Me Not balsam stands ..the only balsam native to the UK... are constantly under threat from the highly invasive Himalayan Balsam..(the larger plants in the image above). If left unchecked they will encroach more and more on the native plants and take their place. Touch Me Not Balsam is the only food source for the rare Netted Carpet Moth caterpillars...see post To Conserve and Protect! on this blog site. The pink flower of the Himalayan Balsam. The yellow flower of the Touch Me Not Balsam. Himalayan Balsam pulled out from the vicinity of the Touch Me Not Balsam stand. 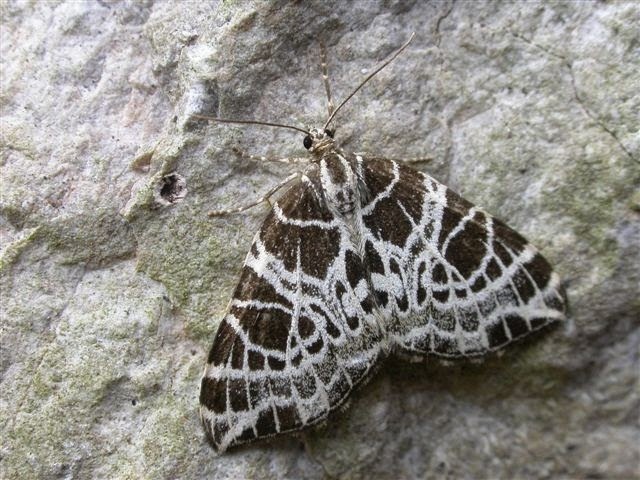 Netted Carpet Moth...usually on the wing between mid July and late August. Watering the trees at Troutbeck Park Farm. The trees, especially the oaks, planted earlier this year as part of the project to enhance the wood pasture at Troutbeck Park Farm have struggled to come into leaf; the protracted dry spell is probably at the root of the problem. Regular watering of the trees is now taking place and thankfully leaves are now beginning to appear. Water containers are filled up from Troutbeck itself and taken up by vehicle as far as possible to where the trees are. This process is surprisingly time consuming as the trees are widely spaced apart and need a lot of water at this critical stage of their development. All in all a fairly crowded week! Stone picking, scrub clearing, grass strimming, brush cutting, Austin outing....Aira Force! After extensive refurbishment works to Aira Force car park, a big tidy up was needed for the surrounding area. Audrey, "barring" a large stone out of the banking above the car park at Aira Force. Loading the quad trailer with stones. They will be used to fill in a boggy area. Steve, raking up some smaller stone prior to grass seeding. The scrub further along the bank needing to be cleared. Steve using chainsaw to cut out and clear the larger scrub. The clearance to the left has revealed a lot more stone that will need to be shifted. Ready to take the first load of scrub or brash away. More brash and stone awaiting removal. Getting tidier. Ray on "ride on brush cutter". By the path leading up to Aira Force. Strimming back large nettle patch. A little work was needed on the strimmer after it "found" some discarded wire in the undergrowth! Austin Sevens in the new improved Aira Force Car Park. If you are looking for a new challenge this summer and enjoy being outdoors, why not come and join the National Trust on one of our outdoor events at Sticklebarn. We have teamed up with Pinpoint Adventure to provide great opportunities for people to get out in the Lake District Fells and have fun, whether you are joining us for a day Ghyll Scrambling or an overnight stay on our Hill Walking Expedition and Wild Camping, there is something for all ages. Ghyll scrambling is the combination of climbing, walking and scrambling whilst ascending a ghyll (stream or small river). Involving various exciting challenges through and around the water; providing a brilliant way to adventure in to the mountains. The ghyll scrambling sessions take place at Stickle Ghyll (Great Langdale), meandering its way up towards Pavey Ark.This is an exciting and challenging ghyll, but also an excellent introduction to ghyll scrambling. We will meet at the Stickle Barn Tavern (Great Langdale, Ambleside, Cumbria LA22 9JU). We will run morning and afternoon sessions (will confirm which session you are on). For the morning session we will meet at 8:50am, this allows us to get started at 9am and finish at 12pm (back to the Sticklebarn Tavern for 12pm or just after). For the afternoon session we will meet at 12.50pm, this allows us to get started at 1pm and finish at 4pm (back to the Sticklebarn Tavern for 4pm or just after). This is a 3 hour session in which we will look to gradually build the skills and challenges of ghyll scrambling. The overall aim of the session is to have an enjoyable and safe time. A two day walking expedition through the mountains of Langdale, taking in some of the best scenery the Lake District has to offer, with a remote overnight camp. Also covering some of the essential considerations when out in the hills such as navigation, weather and route planning. The hill walking expedition takes place in Langdale, starting from the Stickle Barn Tavern (Great Langdale, Ambleside, Cumbria LA22 9JU). From Stickle Barn we will journey in to the hills and mountains of the Lake District, depending upon the prevailing weather conditions we will complete a route involving some of the following mountains; Pavey Ark, Harrison Stickle, Pike of Stickle, Cold Pike, Pike of Blisco. These are some of the most iconic mountains in the Lake District and provide an excellent introduction to expedition hill walking. We will meet at 12:45pm on Day 1 at the Sticklebarn Tavern (The National Trust will confirm which dates you are on), this allows us to get started at 1pm. We will then walk through the afternoon, before reaching our wild camp late afternoon/early evening. We will then spend the night at our wild camp, with the addition of a short walk for sunset/photo opportunities (weather permitting). On Day 2 we will walk back to the Sticklebarn Tavern from our wild camp, with the option of sunrise (if the sunset was not viable), returning no later than 12pm. This is a 2 day expedition in which we will look to gradually build the skills and challenges of expedition hill walking. The overall aim of the expedition is to have an enjoyable and safe time. Guidance on equipment that will be provided and what you need to bring on the day will be available when making enquiries or booking. Cockshott Point is a small promontory located to the south of Bowness. It is one of the few public access points to Windermere's eastern shoreline. Cockshott Point, overlooking Ferry House, and Claife Heights on the west side of Windermere. It is a very popular strip of land as it has an easily accessible and level lakeside path with beautiful views across Windermere. Cockshott Point with a view across the narrow strip of water to the Round House on Belle Isle, Windermere's largest island. The National Trust acquired Cockshott Point in the late 1920s with help from Beatrix Potter. She sold 50 drawings to raise funds for the purchase! Countless people have enjoyed free access to this lovely place ever since. As part of the National Trust's campaign for 50 things to do before you're 11 3/4, Bill and Neil have set up for two of the things to do alongside the Cockshott Point path. Plant it, Grow it, Eat it and.........kites! Bill explaining the benefits of being a National Trust member to an interested passerby. The MV Tern (1891 vintage) passing between Cockshott Point and Belle Isle on her way to the nearby jetty at Bowness to the north. Another view of Windermere's west shore. It has been said that the wooded area, managed by the National Trust, has at least one example of every native tree found in the UK. ...............and so does the beach!